Figure 1. Location map for the Newvale No. 2 Coal Mine, north of Sydney on the east coast of Australia. Uniformitarian geologists and evolutionary paleontologists believe that as countless creatures lived and died over millions of years of Earth history, some were buried in slowly accumulating sediments and then fossilised. Accumulated genetic changes over millions of years supposedly resulted in the evolution of new species, genera and families. In recent years a variety of techniques have been developed to ‘date’ some rocks and minerals using the decay of radioactive elements in them. These methods include potassium-argon, rubidium-strontium, uranium-thorium-lead and samarium-neodymium dating. They are used, for example, on layers of volcanic rocks above and below fossil-bearing sedimentary rock layers. Thus these methods, though not directly dating the fossils, have often ‘confirmed’ the millions of years ages assigned to the rocks and fossils by their interpretation within the uniformitarian and evolutionary framework. Figure 2. General view of the fossilised tree stump (scale bar in cm). The shiny coalified bark around the perimeter can be clearly seen. The only radioactive dating method that could be directly applied to many fossils is radiocarbon or carbon-14 (14C) dating. However, because radiocarbon decays relatively rapidly, it is only useful in practice up to about 50,000 years.3 Thus most fossils, being regarded as millions of years old, are never tested for radiocarbon, because they are not supposed to have any left. Among the sedimentary rock layers, some of the most significant are coal beds. These can be tens of metres thick and stretch for many hundreds of square kilometres. They consist of the broken remains—leaves, twigs, bark, logs, etc.—of countless millions of trees of many varieties. Usually the process of fossilising this vegetation debris obliterates most of the recognisable features of these individual components, as the whole buried mass is transformed into coal. However, sometimes components can be identified—for example, fossilised tree stumps sitting on top of coal beds. Such a fossilised tree stump was found by miners in the Newvale No. 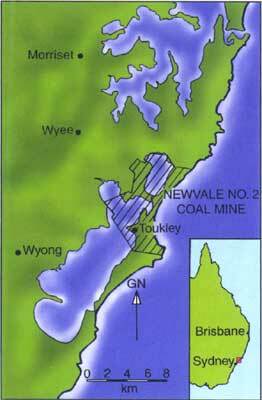 2 (underground) Coal Mine north of Sydney, Australia (Figure 1). A portion of it was saved by one of the miners (Figure 2). Figure 3. 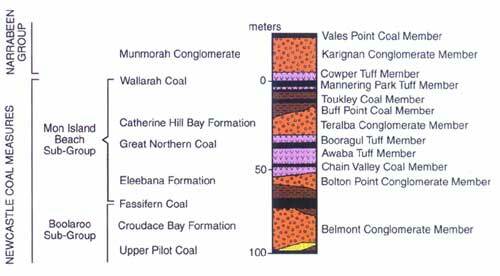 The local geological column for the upper portion of the Newcastle Coal Measures showing where the Great Northern coal seam occurs. Figure 4 shows the relative position of the fossilised tree stump when it was found, surrounded by a 150 mm (almost 6 inches) thick layer of mudstone sitting directly on top of the coal (Great Northern Seam). 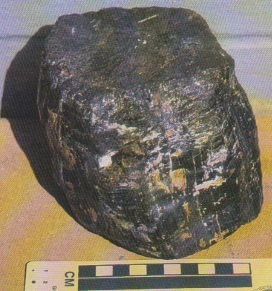 That portion of the fossilised tree stump recovered has a diameter of 110 mm (almost 4½ inches) and stands 100 mm (about 4 inches) high (Figure 2 and Figure 5). A shiny thin ‘skin’ encompasses the outer perimeter (Figure 2, Figure 5 and Figure 6) and represents the original tree bark, which upon burial was coalified. 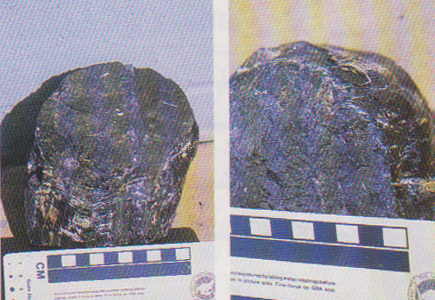 In contrast, the former wood has been silicified (literally turned to stone by impregnation with silica), though it is dull black from still being carbon-rich (Figure 6). Small pieces of the coalified bark and the silicified wood immediately underneath it were sent for radiocarbon (14C) analyses to Geochron Laboratories in Cambridge, Boston (USA), a reputable, internationally-recognized commercial laboratory. The laboratory staff were not told exactly where the samples came from, or their supposed evolutionary age, to ensure that there would be no resultant bias. This laboratory uses the more sensitive accelerator mass spectrometry (AMS) technique for radiocarbon analysis, now recognized as producing the most reliable results, even on minute quantities of carbon in samples. Figure 4. Diagram to illustrate the relative position of the fossilised tree stump sitting on top of the Great Northern coal seam (not drawn to scale). The radiocarbon results are listed in Table 1. There was detectable radiocarbon in the coalified bark, yielding a supposed 14C ‘age’ of 33,700 ± 400 years BP (before present). Table 1. Radiocarbon (14C) analyses of samples from the fossilised tree stump. On the other hand, the small quantity of carbon extracted from the silicified wood sample was insufficient to yield a finite 14C ‘age’, so the result could only be reported as >48,800 years BP, beyond the detection limits. Of course, the wood inside a tree stump would not be >15,100 years older than the bark enclosing it. So the 14C ‘age’ of the bark places an ‘age’ limit on the immediately underlying silicified wood. Of course, if the wood really were 250 million years old as is supposed, one should not be able to obtain a finite age from radiocarbon—all detectable 14C should have decayed away in a fraction of that alleged time. Figure 5 (left). Another view of the fossilised tree stump (scale bar in cm). The shiny coalified bark can again be clearly seen, as can the dull silicified wood within the stump. Figure 6 (right). A close-up of the fossilised tree stump (scale bar in cm). Not only can the shiny coalified bark be seen, but also the growth rings in the dull silicified interior wood. Another objection is that acceptance of these results as genuine 14C ‘ages’ is based on bias, incompetence or ignorance.8 However, those who would make such accusations in reality reject these results primarily because such 14C ‘ages’ ‘cannot possibly’ be obtained from a fossilised tree stump sitting in a layer of ‘250 million years old’ Upper Permian mudstone. Of course, such pronouncements are based solely on a rock-and-fossil dating scheme derived from evolutionary and uniformitarian beliefs, not from some independent, objective scientific standard. 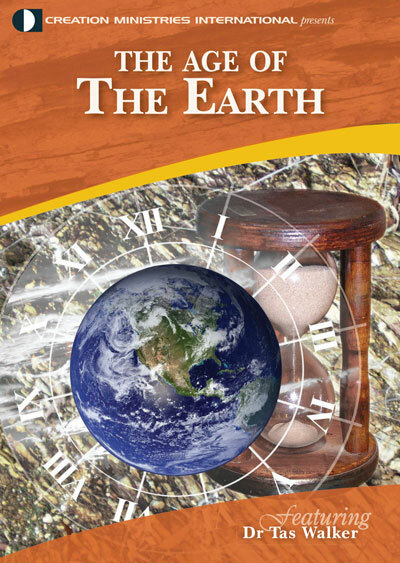 Within the Creation/Flood framework of Earth history, the Flood occurred about 4,500 years ago. Therefore, even though this tree stump must have grown before the Flood (to be then buried and fossilised in sediments laid down by the Flood) there cannot have been more than about 5,000 years at most since it died. On the other hand, a 33,700 ± 400 years BP radiocarbon ‘age’ emphatically conflicts with, and casts doubt upon, the evolutionary fossil and uniformitarian rock ‘age’ of 250 million years for this fossilised tree stump. 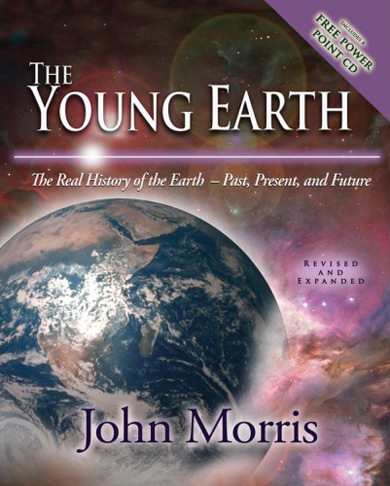 Clearly, the radiocarbon dating method, although demonstrating that the specimen cannot be millions of years old, has not provided its true age.11 However, correctly understood, this radiocarbon analysis is totally consistent with the biblical account of a young Earth and a recent global Flood, as recorded in the book of Genesis by the Creator Himself. Ager, D.V., ‘Fossil frustrations’, New Scientist 100:425, 1983. Return to text. 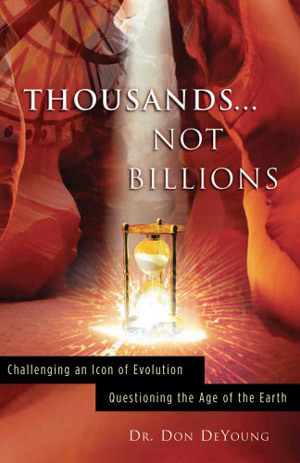 The millions of years interpretation needs to be separated from the reality of the sequence of rock layers containing fossils that are stacked on top of one another. Creationist geologists do not deny that there is a genuine geological record. They recognise that the fossils and rocks are usually found in a particular order, but reject the millions of years imposed on that order. Instead, catastrophic geological processes during the global Flood of Genesis can adequately account for this geological record. Return to text. Radiocarbon (14C) has a half-life (a measure of the rate of decay) of about 5730 years. After about 10 half-lives there will be so little 14C left that it is undetectable. So about 50,000 years is regarded as the upper limit of the radiocarbon dating method. This is not to say that 14C ages quoted in the secular literature all represent real ages, because there are problems with the method (see later in this article). Return to text. Agnew, D., Bocking, M., Brown, K., Ives, M., Johnson, D., Howes, M., Preston, B., Rigby, R., Warbrooke, P., and Weber, C.R., ‘Sydney Basin—Newcastle Coalfield’, Geology of Australian Coal Basins, C.R. Ward, H.J. Harrington, C.W. Mallett and J.W. Beeston (eds), Coal Geology Group (Geological Society of Australia) Special Publication No. 1, pp. 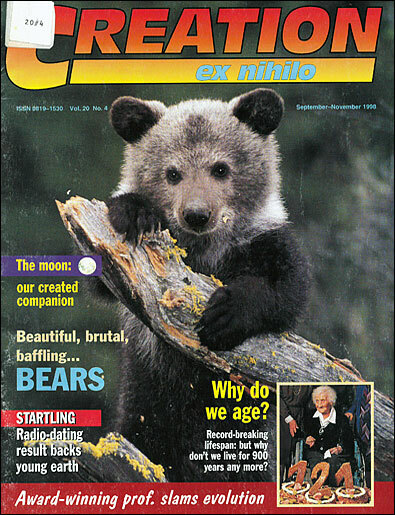 197–212, 1995. Return to text. Gradstein, F.M.m and Ogg, J., ‘A Phanerozoic time scale’, Episodes 19(1 & 2):3–5 and chart, 1996. Return to text. It is worth noting that according to this expert testimony, Professor Hedges would thus have to accept that this fossilised tree stump with a 14C ‘age’ of 33,700 ± 400 years BP has greater than 1% radiocarbon left, so that the effect of even 0.2% contamination would be ‘negligible’. It is thus an acceptable 14C ‘age’, confirmed by Oxford University’s radiocarbon expert! Note that with the previous study also, precautions were taken to exclude 14C due to contamination. Return to text. δ13CPDB denotes the measured difference of the ratio of 13C/12C (both stable isotopes) in the sample compared to the PDB (Pee Dee Belemnite) standard—a fossil belemnite (a shellfish related to octopuses and cuttlefish) in the Pee Dee Formation in the USA. The units used are parts per thousand, written as ‰ or per mil (compared with parts per hundred, written as % or per cent). Organic carbon from the different varieties of life give different characteristic d13C values. Return to text. ‘It’s always difficult for a scientist to comment on a supposedly scientific paper written by a religious fundamentalist who believes in the literal truth of the chronology of biblical creation …. When confronted with this article by A. Snelling, a scientist would argue that something has gone drastically wrong with the field and/or laboratory work and would then propose detailed scientific tests to try to understand the chronological contradictions described in the paper.’ Return to text. Humphreys, D.R., ‘Reversals of the Earth’s magnetic field’, Proceedings of the First International Conference on Creationism, Walsh, R.E., Brooks, C.L., and Crowell, R.S. (eds), Creation Science Fellowship, Pittsburgh, Pennsylvania, Vol. II, pp. 113–126, 1986. Return to text. Also, the Flood buried much carbon. The stable 12C would thus have not been totally replaced in the biosphere after the Flood, whereas 14C would have been regenerated in the atmosphere (from nitrogen). So comparing today’s 14C/12C with the 14C/12C in pre-Flood material would yield too high a calibration, resulting in ‘ages’ far too large. Return to text. Nevertheless, the results of this investigation confirm that radiocarbon is found in fossil wood at deeper levels in the geological record, as should be expected based on the premise that the wood was buried and fossilised during the global Genesis Flood. Furthermore, it may yet be possible, once enough data is available, to recalibrate the radiocarbon ‘clock’ based on a stronger magnetic field, lower cosmic ray influx and thus less 14C production in the past, plus the effects of the Flood suddenly burying so much organic carbon. Investigations are continuing. Return to text.